Familiar vintage, smooth guitar compression at the core, with added extra control for versatility. 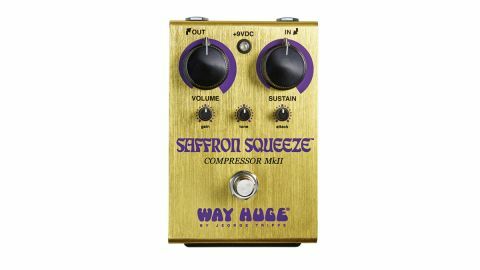 The original Saffron Squeeze compressor featured just large volume and sustain knobs, but Way Huge has brought it back with extra control in the form of three tiny knobs sitting in a row below the original array. While the type of natural squash and sustain you get here, like many guitar compressors, is derived from the Ross/ Dynacomp design, those small knobs let you tweak that sound further. Perhaps most useful is the tone knob, which lets you dial in some top end to counteract any dullness brought on by heavy compression and to give your guitar some presence in a band mix. Alternatively, you can turn it down to reduce hiss. The gain knob sets the input level to match how your particular guitar's output hits the compressor's input to give you flexibility, whereas the attack control governs how quickly the compression kicks in so you can choose to keep the front end of your note relatively natural, or give it a nice pop.